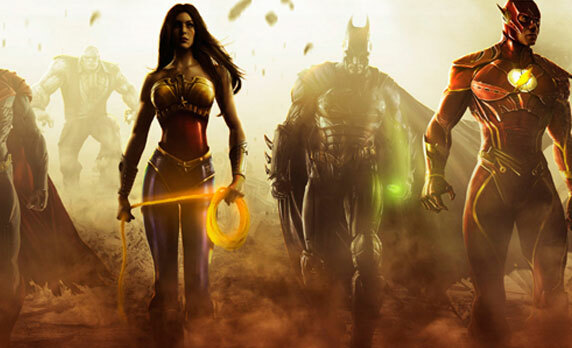 Injustice Gods Among Us is a new fighting game from the folks who brought you Mortal Kombat, NetherRealms. A few years back, a game similar to this was released called DC vs Mortal Kombat. The problem with that game it felt rushed and had a very kid friendly rating. This game fixes most of those issues and removes the Mortal Kombat characters totally. All the major characters from DC are here, Batman, Superman, Wonder Woman, Joker and more. Even lesser known characters get their time like Ares or Raven. The graphics are top notch and all the characters have very unique feel and look. The stages are some of the best parts of the game. Every stage has destructible parts of the environment and you can send your enemy flying through a stage into another stage, which is a lot of fun. The fighting itself is a lot like Mortal Kombat, so if you are good at quarter circle moves or combos then this game will make you feel right at home. The one thing NetherRealms is great at is giving you an actual single player experience in a fighting game, Capcom should take notes! The story mode explains a lot of what is going on and why you can hit Harley Quinn with a dumpster or a car and why it does not kill her. My only gripe is it is a little short. There are also battle modes, which is more like your old school arcade mode for most fighters and a S.T.A.R. Labs mode, these are series of challenges based on each character. The missions here can range form super easy to incredibly frustrating. Online is also a part of the game, very little lag and runs rather smooth. The only really annoying thing I find about the game is all the DLC costumes and bonuses that were out there before launch. Even if you buy the season pass for the game you still do not get all of the costumes out there. Not sure if I can hold that against the game or the publisher trying to make an extra buck, but I sure do miss the good old days were all the content for the game was already in the game when you bought it. Injustice Gods Among Us finally gives DC comic fans something to be proud of and competes with Marvel vs Capcom 3 as on of the great comic book games. If you are a comic book fan or a fighting game fan, do yourself a favor and pick this game up! This entry was posted in Play Station 3, Reviews, video game, Xbox 360 and tagged Batman, DC, Neather Realms, Superman, Video Game, Wonder Woman. Bookmark the permalink.